INTERNATIONAL Rectifier has introduced the IR3621M and IR3621F voltage-mode, dual output bi-phase synchronous buck controller-driver ICs for high performance point-of-load (POL) buck converters used in networking, computing and communications systems. The IR3621 includes a full suite of power management features, including pre-bias protection, sequencing capability, hiccup current limit protection and tight voltage reference accuracy demanded by today's systems. The IRDC3621 Design Kit, featuring the new IR3621M, demonstrates the complete dc-dc converter performance, while showcasing its full range of power management features. For 12V input, 2.5V output, the converter achieves up to 86% efficiency at 15A full load and 400kHz switching frequency when the IR3621M is used with two optimised HEXFET MOSFETs, such as the IRF7821 and IRF8113. Typical applications include powering dual logic application-specific ICs (ASICs), DDR memory power management or other multi-rail or two-phase requirements. The IR3621 is offered in two package styles - the IR3621F is housed in a 28-lead TSSOP package and the IR3621M is housed in a 32-pin 5mm x 5mm MLPQ package for improved thermal performance. The IR3621M provides +/-1% output voltage accuracy and the IR3621F provides +/-1.35% output voltage accuracy. Both provide pre-bias protection and are suitable for non-isolated 0.8V to 3.3V output dc-dc POL converters with either dual output rails up to 15A each, or single output rails up to 30A. The pre-bias feature included in the IR3621 prevents the discharge of any pre-existing output voltage during the start-up of the POL, eliminating negative voltage spikes on the output. A negative voltage spike during start-up in many cases can cause damage to expensive network processor units (NPUs) and application-specific ICs (ASICs), so when a pre-bias condition occurs, it is critical the output voltage charges to its required regulation voltage without going through the initial discharge cycle during soft-start initiation. 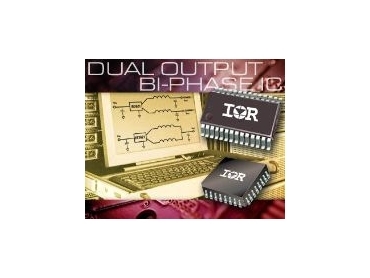 For single output bi-phase configurations, the IR3621 uses the output inductor dc resistance as a current sharing reference, eliminating external shunt resistors. The IR3621 features 180° out-of-phase operation with programmable switching frequency up to 500kHz, reducing input and output filtering requirements and results in lower component count. Two independently programmable soft-start functions allow system level sequencing of output voltages in various configurations, critical for system level start-up protocols. The IR3621 includes a ‘power good’ output signal, which can be used to trigger a sequential rise of output voltages across multiple POL converters. Protection features such as selectable hiccup or latched current limit, thermal shutdown and under- and over-voltage protection ensure system level security during fault conditions.